(Rules Revised March 2018.) WELCOME! Thank you for considering kayaking as part of your vacation experience in Gulf Shores/Orange Beach and Foley, AL . Kayaking with BeachnRiver Kayak Rentals is a relaxing and fun activity. However, you should be aware there are risks involved when participating in a physical activity in a Natural Environment. Summers in Coastal Alabama are very humid and daily pop-up showers occur as temperatures rise. BeachnRiver Kayak Rentals operates the “Old-Fashioned” way. We we do not own Cell Phones (which means we can’t Text — and we have sworn off Emails) so we only make and return calls between the hours of 5 p.m. to 9 p.m. on Days/Months we are open — after our day with our guests is done. Our pace is slow and calm — like the river we are so proud of. Our kayaking adventure is exclusive. We feel are rates are fair — and we treat all our guests equally and fairly. We do not offer Discounts of any kind. Kayaking with BeachnRiver Kayak Rentals is one of the least expensive options of “Fun Things To Do” in the Gulf Shores area — and we feel we offer the best value for the rate. We are aware our experience will not appeal to some. But if you are: Nice, Polite, Respectful of elders and others; if you can enjoy the quiet, natural beauty of nature without having to get drunk and rowdy; YOU are our PERFECT guests! BeachnRiver Kayak Rentals does not accept reservations by Email, Social Media requests or by Messaging. Our most current info will always be on our telephone Voicemail Messages — which may contradict the website. We reserve the right to make changes in Daily Operations, Rates and Policies for any reason, and at any time. No Credit Cards or Personal Checks accepted. As a courtesy please arrive with total correct amount. Tips are encouraged and appreciated. For your comfort (and to be courteous to others with allergies or sensitivities) please have your BUG SPRAY AND SUNSCREEN ALREADY APPLIED DOWN TO YOUR TOES PRIOR TO ARRIVAL. Application can easily take 5 min. per person and will cause delays. Please be courteous and abide by this request. NO CIGARETTE OR CIGAR SMOKING. NO PROFANITY. NO LOUD MUSIC and NO ILLEGAL SUBSTANCES — INCLUDING ALCOHOL — IS ALLOWED ON THE PROPERTY. PERIOD. NO EXCEPTIONS. No weapons of any kind are allowed on property regardless of permits. No pets or animals of any kind allowed on property. Owners reserve the right to inspect any and all BACKPACKS AND COOLERS FOR ILLEGAL SUBSTANCES. Anyone arriving to site visibly impaired by alcohol or illegal substances will have their keys and driver’s license confiscated or be ordered off the property. Authorities will be be contacted and violators will be subject to possible trespassing and criminal charges. All participants must read and sign a WAIVER OF LIABILITY FORM ACKNOWLEDGING THEY HAVE READ/UNDERSTAND AND WILL ABIDE BY FLOAT RULES AND REPLACEMENT FEES. Care must be taken to print legibly. To facilitate registration with large groups (over 10 kayakers) you may download, print forms and bring completed forms. If unable to print out forms BeachnRiver Kayak Rentals will provide copies upon arrival. International guests MUST provide a photocopy of passport. Kayaking has potential dangers. Walking the property has potential dangers: fire-ant beds, mole holes, armadillo holes, brambles and slippery sand etc can cause injury. Entering onto the private property of BeachnRiver Kayak Rentals located at 18743 Keller Rd. is in itself an implied acceptance of all RULES and WAIVING OF ANY AND ALL LIABILITY towards owners. 3.) PRINT AND SIGN THE “WAIVER OF RELEASE” page and LEGIBLY PROVIDE YOUR NAME, PROVIDE NAMES AND AGES OF CHILDREN, YOUR CORRECT (LEGIBLE) EMAIL ADDRESS, TELEPHONE, (Cell Phone Number) DRIVER’S LICENSE NUMBER AND STATE OF ORIGIN OF DRIVER’S LICENSE, FULL AND CORRECT ADDRESS AND CREDIT CARD INFORMATION . Consenting adults will be held liable for any damage to private property, boats or equipment and will be charged accordingly to signed replacement fees. In the event of damage, consenting parent/adult/guardian will be emailed a photo of damage along with statement of the occurrence and will receive an email bill. BeachnRiver Kayak Rentals reserves the right to take legal action to collect after 30 days unless contacted with payment arrangement. Pop up showers are to be expected Daily during Summer and can last from a few minutes to an hour. We cannot guarantee you will not get rained upon. No Refunds or Discounts will be offered in the event you get rained upon. If it is raining at our location during your arrival, “River Rick” may suggest a later departure time. (Please check local interactive weather radars for the Bon Secour, AL area prior to arriving. Often it is raining in downtown Foley/Gulf Shores/Orange Beach/Ft. Morgan beaches yet we do not get a drop of rain). All participants should arrive expecting to get wet. Your feet WILL get wet and possibly dirty. DRESS ACCORDINGLY. For groups requesting reservations for greater than 10 kayaks we ask reservations be made at least 48 hours in advance and paid in full with required paperwork 24 hours in advance. NO REFUNDS. We ask there be ONE individual act as “Group Leader” who will phone in their desired Reservation Time and request the Number and Types of Boats ( keeping in mind weight limitations) after confirming a FINAL COUNT with their party. To facilitate the reservation process (and to get you on the water sooner), please Collect all Monies and make sure ALL participating kayakers Read/Review (and review with minor children) the Rules, Replacement Cost Info, Liability Release Info, F.A.Q. and Suggested Items To Bring . 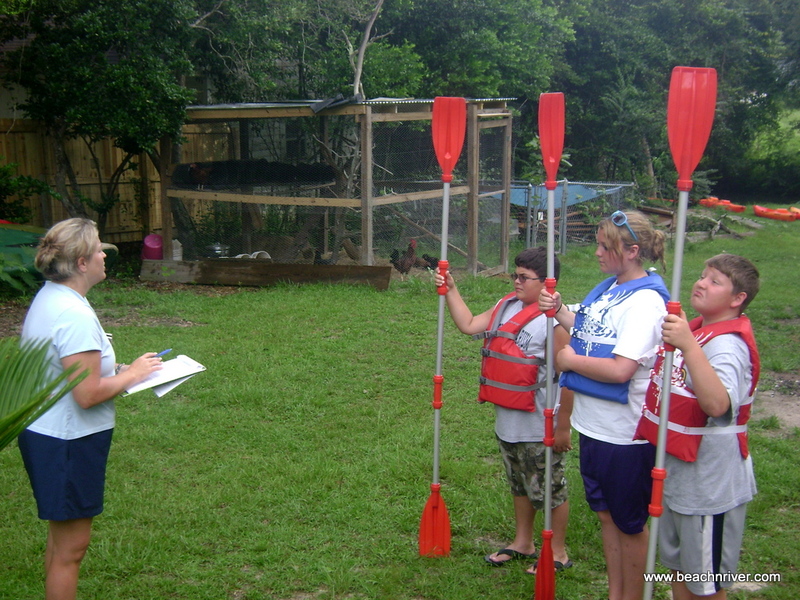 The “Group Leader” is also to instruct all members of the group to be silent and attentive while given instructions, obey all requests given by “River Rick” or BeachnRiver Kayak Rentals’ representatives and to defer to your leadership/authority. Please honor your reserved times and the number of boats requested. If changes need to be made, please give us the courtesy of communicating your changes at least 24 hours in advance so that we may allow others to enjoy the kayaking experience. BeachnRiver Kayak Rentals feel our Rates are fair — and we treat all our guests equally. Please do not phone to ask for Discounts of any kind. No soliciting of any kind is allowed. No expectations should be made that photos will be taken of you or your family — or that they will be posted on Facebook/Social Media or be emailed to you. If you would like photos of your experience, please bring a camera or cell phone in a suitable dry-bag or waterproof case. We consider it unacceptable to Video our Premises or other Guests on our Property without obtaining Signed Waivers or Model Releases from each Guest present. If we find any Media taken illegally on Social Media or on the Web we may: 1.) Request a removal 2.) Report you in violation of our rules. Beachin’ Betty requests NO PHOTOS BE TAKEN OF HER or of the Property without express WRITTEN permission. REMEMBER: you are on private property. Please RESPECT MY PRIVACY and honor this request. I will remind ONE TIME. The second time I will request you leave the property and you will forfeit any monies paid. Photos posted of Beachin’ Betty on any form of Social Media/Internet without a Signed Model Release may be asked to be removed and/or reported as a violation. Unless Instructed Otherwise, PLEASE PARK AND HAVE ALL MEMBERS OF YOUR PARTY REMAIN IN YOUR VEHICLE(S) UNTIL ALL KAYAKING GUESTS IN YOUR PARTY SIGN NECESSARY “RULES” AND “LIABILITY WAIVERS” and Complete Marine Police Info. Please park in spaces designated by owner. Do NOT cross through shrubs, tree-line, fence-line or over chained drive. There may be brambles, broken limbs and hidden and rusted barbed-wire fencing. Do NOT PARK in “NO PARKING” designated areas. Respect should be given toward parking, pathways and flowerbeds, burn piles, wood piles etc. The swimming pool and trampoline is NOT available for paddlers. Owners will kindly request any individuals to stay away from pool, trampoline and private area ONE TIME. The second request will order individuals off the property. There will be NO REFUNDS for any breach of rules and participants may be refused future entrance onto the property depending on the severity of breach. NO TOURS GIVEN. PRIVATE ROAD Begins At Gravel. Please Respect Private Roads/Property. Do Not Trespass. THERE IS NO VIEW OF THE RIVER FROM OUR PROPERTY. You cannot see the river where you will float from our property. We provide ample descriptions and videos as well as a Frequently Asked Questions section on the website to answer the most common questions about the experience. We ask you respect our privacy (and the privacy of our neighbors). We Do NOT offer a Public Launch. Personal Kayaks/Watercraft are NOT ALLOWED to Park or Launch from our location. It is illegal to impede traffic and park alongside the roads. There are no legal or public places to launch Kayaks or Boats anywhere near our location. PRIVATE ROAD BEGINS AT GRAVEL. Violators will be considered as trespassers, authorities will be contacted and vehicles will be towed at your cost. The property has surveillance cameras in use. All neighbors have surveillance cameras in use. Be a Good Neighbor — families that live along the river enjoy the peace and quiet of nature. Please be respectful and keep noise and music to a low level. It is unacceptable to use profanity. Should you breach this request you will be asked to leave and your payment will be forfeited. Be a Good Neighbor to Fellow Boaters — you will come across swimmers, pleasure boaters and fishermen. Be respectful of their rights to enjoy the river and give right of way. DO NOT DOCK THE BOATS — private property owners do not take kindly to trespassing! DO NOT Chop or Grab Native Plants — as they provide shelter for fish and wildlife and prevent erosion along river and creek banks. DO NOT LITTER!! — be a good steward of the earth. Put your trash (including cigarette butts!) in trash bags. Do Not Use Paddles To Push In Sand To Propel Forward. Do Not Use Paddles As “Stand-Up” Paddles —If you get stuck on sand get out of the boat and carry the boat until you are able to float again. Do not force kayaks over tree limbs and log dams. It Is Important to Consider Water Moccasins Are Active in the Summer Months — DO NOT put your hands under logs, in holes etc. without first making a great deal of noise. Snakes are easily seen as they swim above the water and will scurry off if frightened by loud noise. Do Not Use the Paddles as Weapons or Swords Against One Another. They are not toys. You WILL be liable for any damages to boat and gear. Children Under the Age of 10 MUST Wear LIFE JACKETS During the Duration of Float. In the Event of Group Functions, RULES MUST BE READ BY ALL PARTICIPANTS and Explained to Minor Children. My signature represents that I have read, or have been read and understand the above Rules. I also certify I will abide by the above rules. I also understand and agree to be held personally liable for damages and such damages will be charged in the form of an invoice sent via email. * You may be able to purchase the above equipment for less — we realize this. However we will lose inventory and revenue as a result of damage and turnaround time to replace can take weeks. We may incur higher purchase costs due to price increases, cost to ship and handle etc. OUR LOST TIME = LOST INCOME. Please respect our equipment.